An ex-California girl, V.S. Kemanis is now a New York based attorney. 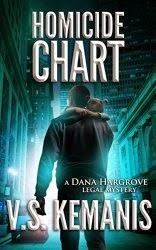 In addition to the prior Dana Hargrove legal mystery, she has three collections of short stories available. The first Dana Hargrove book, Thursday’s List, took place in the ‘80s. In Homicide Chart the timeline moves up several years, 1994 to be exact. Dana has a lot more experience as a prosecutor, not to mention the additional responsibility and pressure from a caseload made up of murder prosecutions. To top it off, she now has a young son whose care she juggles with the help of her husband and a nanny. This story focuses on two homicide cases, one with a gang member already on trial and another where Dana has a personal stake. With a couple minor exceptions (a detour for some unneeded backstory on a minor character and unneeded repeating of some additional backstory regarding Dana’s mother-in-law), the story is well written. There was plenty of mystery and intrigue that kept me guessing how the two cases would resolve. A worthwhile read that left me eager to see what comes next for Dana.